A book based on Gallup’s groundbreaking research into the role of friendships in the workplace. Along with several leading researchers, Rath pored through the literature, conducted several experiments, and analyzed more than 8 million interviews from The Gallup Organization’s worldwide database. His team’s discoveries produced Vital Friends, a book that challenges long-held assumptions people have about their relationships. And the team’s landmark discovery – that people who have a “best friend at work” are seven times as likely to be engaged in their job – created a conversation on this topic in workplaces around the world. 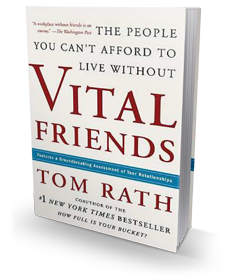 Drawing on research and case studies from topics as diverse as management, marriage, and architecture, Vital Friends reveals what’s common to all truly essential friendships: a regular focus on what each person is contributing to the friendship – rather than the all-too-common approach of expecting one person to be everything. People who have a “best friend at work” are seven times as likely to be engaged in their job.